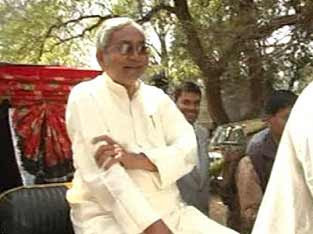 Patna, March 6, 2009: Bihar chief minister Nitish Kumar took a rickshaw to watch Slumdog Millionaire, the film that won eight awards at Oscars besides innumerable other awards including Golden Globe. Nitish had earlier promised to see the film when he came to Delhi.This seems to be a stunt to attract more and more voters before forthcoming Lok Sabha polls. By going to theatre on a rickshaw he wanted to show his support to poor, who live in their thousands in Patna, the worst capital that any state has across India. The slum dwellers say that the film depicts them in an absolutely negative way and many claim that the film takes a potshot at their lives. They say that despite being poor and deprived they remain committed to the values that come with being a normal human being. Mohammad Faisal, who works at a leather factory says that when he heard about the sort of response that the film was getting across the world, he did his best to get the ticket of the film on the very same day that film opened, but the film depressed him badly.He says that the film is so negative that a common resident of a slum may not be able to see the whole film.Another youngster Raj Kumar who studies commerce in a college and works part time to fund his education says that the film presents the lives of slum dwellers in very bad light. He says that he was happy to know that Amitabh Bachchan opposed the film. Several slum dwellers in Patna and Surat besides several other cities have staged protests against the film.There are other dismal statistics about poverty in this fourth largest economy in the world (by GDP at purchasing power parity): 126th rank out of 177 in the World Human Development Index and the rate of child malnutrition double that of sub-Saharan Africa. With such factual and visible evidence reinforcing existing bias, the defining element of our economy would remain identified with our poor millions, much as we would like it to be otherwise. The painful paradox of such poverty in the midst of consistently high rates of economic growth over the last few years and the sustained development effort pursued through economic planning since 1950 is the measure of the pathos in the Indian story.What is all the more disquieting is that there has been no dearth of recognition in political rhetoric or official thinking of the need for elimination of poverty as the primary objective for the country but what has been done and accomplished has fallen so tragically short of proclaimed intentions.